The lower belly is one of the main problem areas when it comes to losing weight, because it just refuses to let you go. It really messes up clothing sizes and other such things because sometimes even if you are losing weight over all, that belly just sticks to you as if with glue. There is always exercise and dieting but one must remember that there are only a few specific exercises that target lower belly fat and just a lot of leg days will not cut it. Following is a list of exercises, thank me later! Also known as the Mermaid exercise, this one puts a lot of pressure on your lower abdomen and gets the job done. It is pretty easy to do as well, all you have to do is lie on your back with your hands under your head, bring both your legs together, exhaling as you lift them up, holding them there for a few seconds and then brining them back down. These do wonders for your lower belly and your thighs. Lie down like you would do for double leg lifts and then lift each of your legs up one by one while the other one is just below it- flutter! We all know the benefits, do we not? Most people generally know how to do them but let me still give you a rundown. Lie on your back, hands behind you head with your legs folded. Lift your upper body up and try to get them as close to your knees as possible. The criss cross will help you lose weight as well as tone your body as a whole. All you have to do for this one is lie on your back with your hands behind your head as usual with your legs folded. After that, bring the left side of your upper torso up to meet your right knee and vice versa. An exercise ball is a great investment. It helps your agility as well as stability. 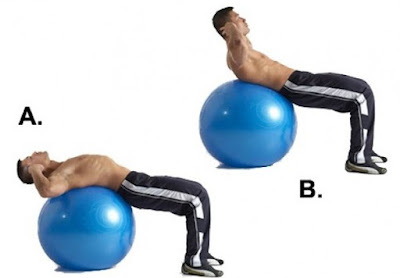 Exercise ball crunches: the name is pretty suggestive. All you have to do is your regular crunches, but with your waist on the exercise ball. This one helps you work on your strength and better your muscle tone. All you have to do is, lie down but not on your back, but sideways with your body resting upon the leg and arm of the side that you are lying on and hold this position. Start with about half a minute and try to get to at least a couple of minutes. This one is pretty easy. It is like doing crunches but when you do them, raise your legs up high and then bring your torso up to reach your pelvis. Continue inhalation and exhalation throughout. I believe the name gives it away. Lie down on your back and then lift your hips, inhaling and exhaling continuously, with your hands under your head. These exercises do help, you know?